My family was a bike family. As a toddler I had the common red and white radio flyer tricycle, which I spent much time using as a scooter thanks to its brilliant back step design. My mom had a light blue almost silver ten speed bike with a basket. My dad had a green foldable fixed gear. They were stored in our huge multicar/loft-having/separate structure that we commonly called, "The Garage." The big "2 wheelers" as us kids called them back then, hung on the wall. My bike usually just sat there in a corner. One summer I started to hang out with kids who had "grown up bikes" and my dad started to realize it may be time for my own 2 wheeler and for my sister to get my trike... But with his work schedule being as it was, he did not have time to teach me. His solution? Training wheels. My mom's bike was too high for my shorty legs, and with the gears and handbrakes, it would be a disaster. So he put the training wheels on his ugly green fixed gear for me to ride. All the kids I played with had nice bikes. Some had Huffy's, some Schwinns; all had banana seats, tassels, baskets or flags. I had an ugly green bike with chipped paint, cruddy hands, and training wheels. Worse of all, I didn't even have access to my bike unless my dad was home to open the garage. Luckily the neighbor kids next door had an extra bike; a beautiful red and white Schwinn... Which had no training wheels. I had no choice but to learn to ride or be left behind by Steve and Angela, the two generous siblings with the extra bike. Steve was 2 years older than me, Angela was 1 year younger. She couldn't ride either and Steve was in the process of teaching her when I joined in that summer. It started slow. Since the bikes were low, I could sit on the seat and my feet could reach the ground, unlike my ugly green bike. We started to sit and push off with our feet, and just roll with it. As we went faster we'd try to get our feet on the pedals a little, until we lost our balance and our feet would hit the ground again. It went on like that for a week or two, until my dad came home from work early one Saturday and saw me. He asked if I thought I was ready for the training wheels to come off my bike and I said YES. Did I mention that ugly green bike was about 50 feet off the ground? My first attempt to hoist myself up with no training wheels resulted in a skinned elbow and knee. My second was accomplished by using the backyard fence as a stabilizer. I went a couple of pedals and hit the hard concrete sidewalk with my side. With my mother engrossed in laundry in the basement with no way to check up on me, I announced I was going outside to play. I grabbed my dad's garage keys, undid the padlock and manage to lift the heavy door about 2 feet. (No automatic garage door opener for my dad... That would be an insult to his manhood.) The lucky thing was that 2 feet was big enough to slide into the garage on my belly, grab my bike, push it out sideways and be on my way. Upon entering my father's testament to all things manly, *his* garage, I found what he had snuck in... A brand new black and yellow BMX bike. It was glorious. It was also a boy's bike, but that didn't matter... I was going to ride this thing, and I was going to ride it NOW. I scooted it out the door on its side, and jumped on. It was low enough to the ground so my feet could touch the floor. Perfect. I gave a push and took off at full speed, pedaling like my life depended on it. I had to be quick, get a ride in down the block and get it back in the garage before my mom came out to check on me. I got as far as the neighbor's house next door. I wasn't caught by my mom, or dad or Santa Claus. I was caught by the telephone pole I rode straight into at full throttle. I saw the pole getting closer and pedaled backwards to apply the brakes... Like I had learned on every single bike I had ridden before. That didn't work on this bike. No, this bike had weird levers on the handles that I messed with before taking off. I didn't give them much of a thought... Until I crashed. Yep. Hand brakes. That would have been good to know. I grabbed the bike and limped back to the garage, slid in, put it back where it was, locked the door, went back inside and watched TV. I was done with bikes for the day. Max got the bike, and when I'd go over to play with him, he'd ask me if I wanted to ride it. My answer was always No. I did finally get a bike later that same year. I got to pick out the color, but make and model, never a choice as far as my dad was concerned. He picked out a girl's 10 speed that I'd hasten to say was bigger than my mom's bike. 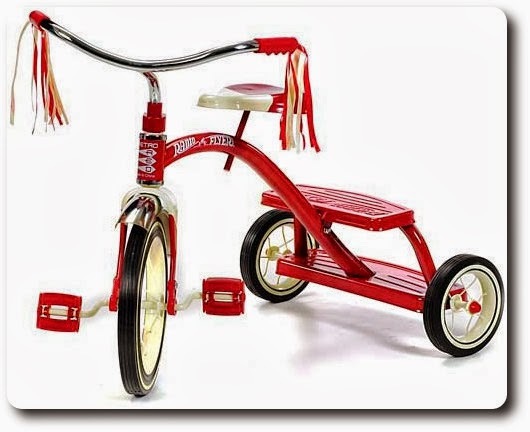 It had curved handles which meant no tassels, it had handbrakes which meant no back pedal stopping and skid marks on the sidewalk to compare with other kids, and no basket, banana seat or flag. But it was shiny and red... and not ugly green.